“As a novelist, I’m a big game hunter; I don’t hunt chipmunks.” That was Tim O’Brien quoting his friend and fellow fiction master, Robert Stone, at the May 2 tribute to Stone at the august Folger Shakespeare Library Theater in Washington, D.C. The Vietnam War and its aftermath were themes in much of Robert Stone’s work, most prominently in his masterpiece, Dog Soldiers, the 1974 National Book Award-winning novel. Comparing Stone to Mark Twain and Ernest Hemingway, O’Brienwhose literary work is strongly influenced by his service in the Vietnam Warspoke about his admiration for Stone and did an emotional tour-de-force reading from Dog Soldiers. He was joined by three other novelists, Madison Smartt Bell, Stephen Goodwin, and Lauren Groff, who also read from Stone’s fiction and spoke about his life and work. 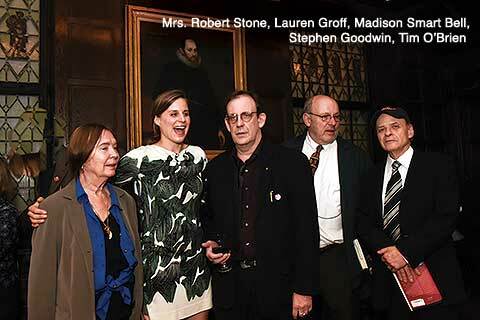 The evening was sponsored by PEN/Faulkner, the writers’ organization that Robert Stone helped found in 1980. Robert Stone: A Folger Shakespeare Library tribute. Commendations: Three awarded the organization’s highest honor.